This exceptional antique George III sterling silver mug has a cylindrical tapering form with a flared rim. 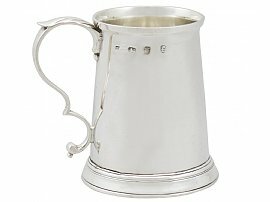 The surface of this silver mug is embellished with the engraved initials 'ICW'. This Georgian silver childrens mug is fitted with an impressive sterling silver opposing scroll handle ornamented with a simplified leaf decorated thumbpiece. The circular spreading foot of the mug is encompassed with tooled decoration, in addition to an applied moulded border to the rim. 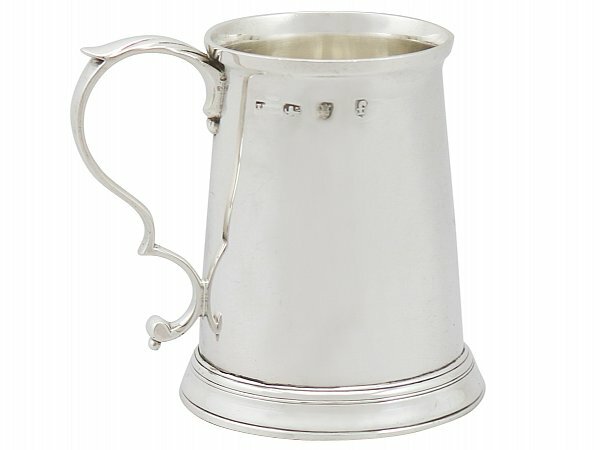 This 18th century silver mug is an exceptional gauge of silver for its type, exceptional quality and in exceptional condition in keeping with age. Full hallmarks struck to the underside of the mug are clear in keeping with age and location. Length from back of handle to rim 7.6cm/3"